Participants: Etel Adnan, Alex Baczynski-Jenkins, Beverly Buchanan, John Divola, Lubaina Himid, Hassan Khan, Jumana Manna, Helen Marten, Sliman Mansour, Alice Neel, Lydia Ourahmane, Walid Raad, Malick Sidibé, Mounira Al Solh, Kenneth Tam, Wolfgang Tillmans, Sharif Waked, Rafal Zajko. Acts of Translation is a group exhibition tracing lines of resistance that disassemble and disarm language. Creating a dialogue between works from the Abu Ghazaleh Collection and seven invited artists, the exhibition uses translation as a metaphor for the processes embedded in the production of artistic practice. Artists in Acts of Translation toy with language in order to question and rupture the process of its construction. Using video and animation as a visual tool and trope, works by Hassan Khan, Mounira Al Solh and Sharif Waked explore different deliveries of speech, focusing on illegibility, appropriation and mistranslation between English and Arabic. A new site-specific commission by Lydia Ourahmane further investigates this process by considering language as a parasite. Creating a symbiosis between objects, Ourahmane reflects on the social and political implications of different tongues becoming one, and of, the other. Four works by Etel Adnan, marking different points in the development of her practice, reflect on her refusal to write in French during the Algerian war of independence (1954-62) as a turning point in the production of her visual vocabulary. Similarly, Palestinian painter Sliman Mansour's Graffiti (1990) symbolises the artists' desire for resistance by evading Israeli art materials and developing a new formal language by using locally sourced materials such as coffee, hena, mud and clay. A series of Beverly Buchanan's GROUNDINGS - sculptures for which the artist reproduces structures, most of which are houses - also enact a belief in the ability of objects to semiotically render the stories and histories embedded within their material. Other artists in the exhibition use the body to translate intimacy and desire through performative gestures. Alex Baczynski-Jenkins' Federico (2015) creates a situation of affection and sensuality by employing subtle figures of relationality and entanglement in a choreography of touching hands. Works by Lubaina Himid, Alice Neel and Rafal Zajko are equally preoccupied with people and communities, offering complex translations of individuals and their surroundings in ways that challenge their representation. 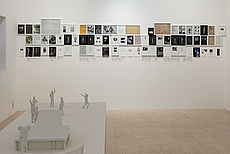 Exemplified by the array of different forms and practices included in the exhibition, Acts of Translation recognises that, although through art we may often wish to speak universally, the particularities of a place and time, of a history and memory, require translation to be subjective, sensitive and deftly specific. The exhibition acknowledges the potential for mistranslation and uncertainty, vouching for a practice of translation aware of its edges; of what may possibly be, or render itself as, untranslatable. At stake is a desire to unpack how the languages of art partake in what can be said and done, seen and heard, known and withheld. Acts of Translation explores the artist as translator of other narratives, other histories, other possibilities, other truths. Acts of Translation is organised with the support of the MMAG Foundation's team: Sonja Junkers and Noura Al Khasawneh, Co-Directors; Reham Sharbaji, Public Program Manager; and Ahmad Ameen, Cultural Manager. Artist and choreographer Alex Baczynski-Jenkins presents Federico (2015), a choreography of touching hands enacted by two performers at various moments throughout the duration of the exhibition. Artist Lydia Ourahmane and Eliel Jones, curator, discuss Ourahmane’s site-specific commission as part of Acts of Translation, in relation to her wider practice. Accompanied by Batool El Hennawy, artist and translator, Eliel Jones, curator, gives a tour of Acts of Translation, expanding on the ideas behind the exhibition. Why does the dead dog speak? As a closing event for the exhibition, Eliel Jones, curator, presents a screening of moving image works, providing further context and close reading into the lines of enquiry within Acts of Translation. To accompany the exhibition, Yvonne Buchheim, artist and educator, Sarah El Kamel, writer and journalist, and Ali As’ad, researcher and architect, will deliver a series of workshops responding to the themes within Acts of Translation. 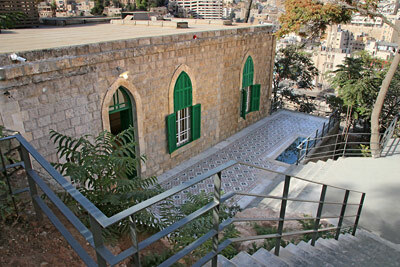 MMAG Foundation is based in Amman, Jordan, and features permanent gallery spaces and a public library, hosting exhibitions and a program of talks, workshops and screenings. MMAG Foundation is currently working on developing a free art school. The Abu Ghazaleh Collection focuses on art concerned with the human condition and advocates a dialogue between artists from different cultural backgrounds and generations. Eliel Jones is a writer and curator based in London. He is the 2016–18 Curatorial Assistant: Commissions at Chisenhale Gallery, an 18-month post that is part of Chisenhale Gallery's Curatorial Trainee Programme for emerging curators supported by Sirine and Ahmad Abu Ghazaleh. Acts of Translation is organised with the support of MMAG Foundation’s team: Sonja Junkers and Noura Al Khasawneh, Co-Directors; Reham Sharbaji, Public Program Manager; and Ahmad Ameen, Cultural Manager. 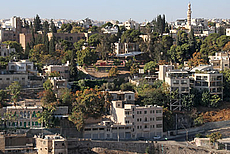 Desde la Fundación artística MMAG y el Centro Wild Jordan, hasta otras galerías y casas históricas.